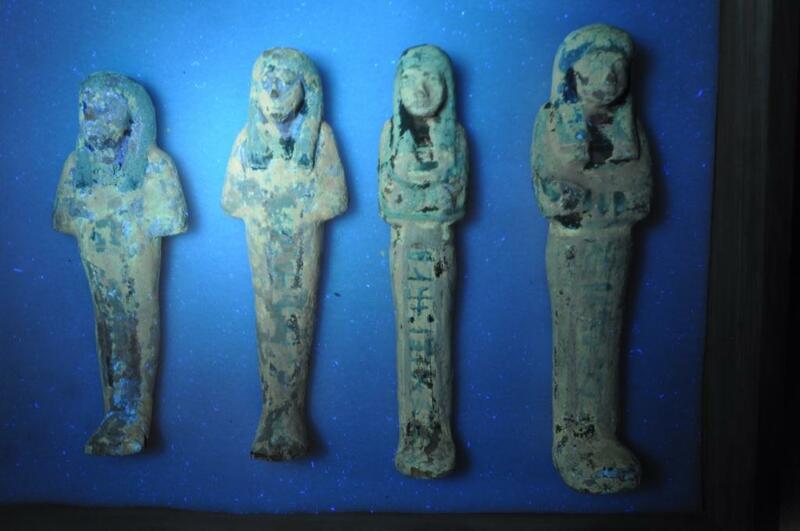 At first the box came into the lab with 3 shabtis, and then we found that there were 3 more in storage that may belong with the box as well. 4 of the shabtis are very similar in appearance whereas the other 2 are slightly different, so they may actually not be associated after all. Can you spot the 2 different shabtis? All of these objects are made of wood, gesso, and paint. And as you can see, all of them have an orange-yellow coating on their surfaces. In my last post I posed the questions “what is this coating?” “is it an original varnish or is it a later restoration?”. My initial guesses were that it is either an original pistacia resin varnish, a later cellulose nitrate (or other old restoration adhesive) coating, or a combination of the two. Well, there are several things we can do to try to answer these questions and to narrow down the possibilities. One of the first things I did was to look at these objects very carefully using our binocular microscope. I could see that the coating was applied unevenly, especially on the box, and that it is actively cracking and flaking. Another thing that I noticed was that there are areas on the box where the paint is lost and where the coating extends over the loss onto the gesso below. 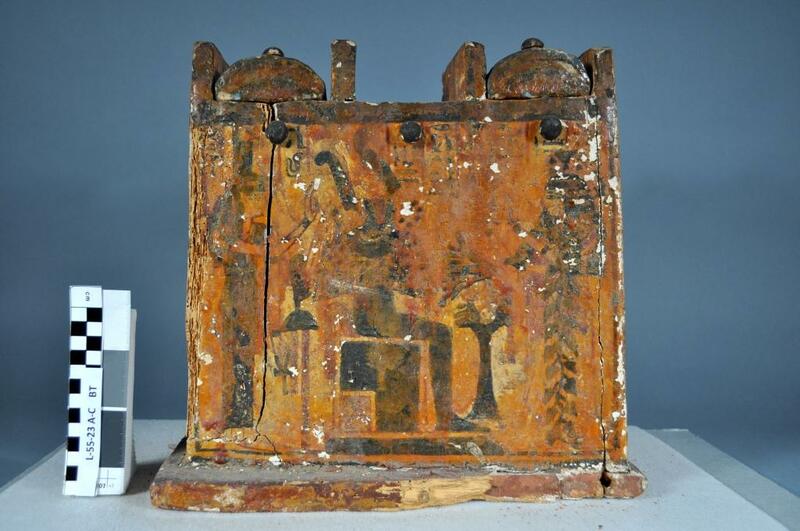 A detail shot of one side of the shabti box – the yellow arrows are indicating where the coating extends over areas of paint loss onto the gesso. 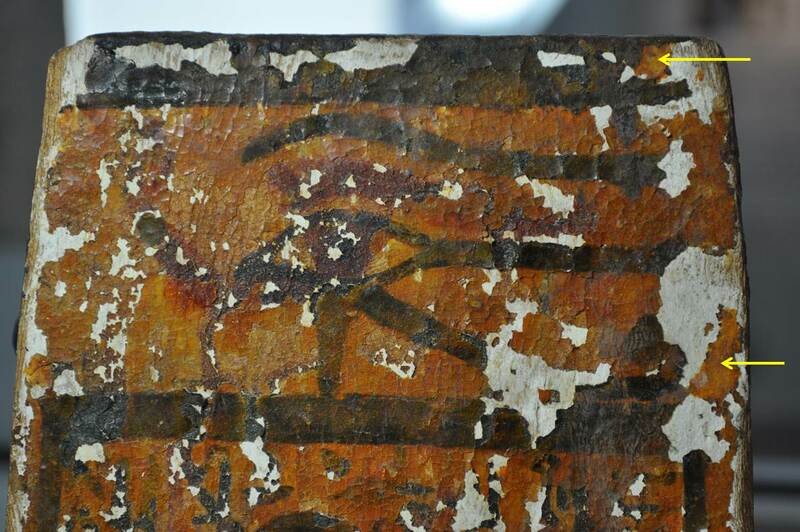 Usually, this would indicate that the coating was applied after the damage occurred (so sometime after excavation, either in the field or soon after coming to the museum). So this is one clue, but doesn’t really answer my questions. The coating on the box and the shabtis has a yellow-orange appearance under UV – but not the bright orange that we expect to see from shellac. So UV examination was helpful (it eliminated shellac as a possibility) but didn’t answer my questions either. Next, I did a microchemical spot test on a couple of the previously detached flakes of the coating. We’ve used spot-testing before in the lab – the last time I wrote about it was in reference to the mystery fibers on Tawahibre’s coffin. In this case, I carried out a spot test for nitrates using diphenylamine (according to instructions in Material Characterization Tests for Objects of Art and Archaeology). Using this test, a sample containing nitrates will turn blue once a solution of diphenylamine/sulfuric acid is added. Below you can see the result of the test on one of the coating flakes from the shabti box (left) and the test on a control sample of cellulose nitrate adhesive (right). Based on these results, it seems that the coating does not contain cellulose nitrate. This does not mean that the coating does not contain another recently-added adhesive. We have a few other ways of narrowing down the possibilities even further, and I will write about our continued work on this in my next post.